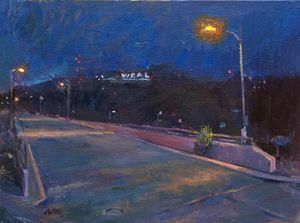 While I was painting this picture off of Buena Vista and 41st in Baltimore, a guy with big travel back pack stopped and told me he'd never scene anyone paint the this bridge. He looked homeless, but not the type of homeless guy with mental problems but someone who chose this lifestyle and matter of point. He gave me compliment and proceeded to walk on. I spotted him going under the bridge. A few minutes later the smell of campfire and smoke arising from under the bridge appeared. As I was painting the smell of campfire brought back memories of past camping trips in boy scouts and other camping trips. 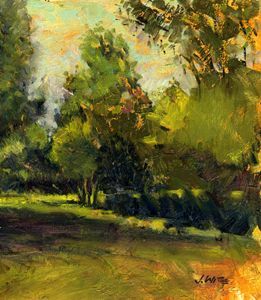 Painting is a meditation, and as you paint memories are often brought up in your mind that could be triggered by a sight, smell or sound. Jason Witte is a painter residing in Baltimore Maryland. 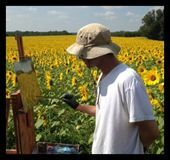 He has been creative all of his life with art jobs ranging from airbrushing T0-shirts, to computer animation and scientific illustration. 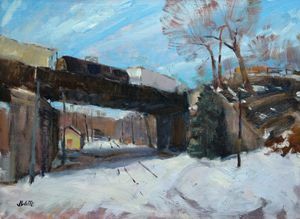 His latest interests including painting directly from life in the plein air method.